I missed this one last week, but anyway, this should be a good news for any Misaka (and Tamiya) fans. Yep, Nendoroid Petite x Mini 4WD: Mikoto Misaka drives Thunder Shot Special has been available for pre-order since February 22. A certain Misaka’s four-wheel-drive car! Tamiya’s Mini 4WD model car series has just celebrated its 30th anniversary and is now working in collaboration with the Nendoroid Petite series to create a joint product that will be produced by Dengeki Hobby Magazine! The third character to join the series is Mikoto Misaka from ‘Toaru Kagaku no Railgun S’! Using specially developed parts, the Nendoroid Petite figures can easily jump into the Mini 4WD models and drive around! Each car is specially designed to suit the image and colors of the character that the car is designed for, and the figure mount is a cleverly designed battery holder! A set of stickers is also included with the Mini 4WD to add even more flair to their ride! As you may have known, this is one of the products from the joint collaboration between GSC and Tamiya that was announced last year. 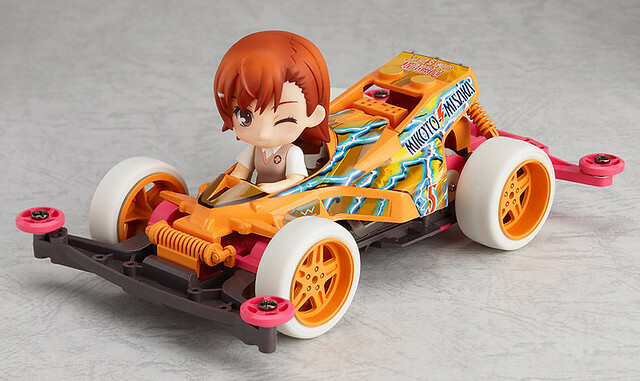 Nendoroid Petite x Mini 4WD: Mikoto Misaka drives Thunder Shot Special will be priced at 2100 Yen and scheduled for June release. This Petite will be available at the GOOD SMILE ONLINE SHOP and orders can be placed between the February 22 from 12:00 until the March 21 at 21:00. This entry was posted in News and tagged misaka, nendoroid, petite, tamiya, toaru kagaku no railgun.